I love cooking but get frustrated with all the slicing and chopping of vegetables, especially when I am making soups, salads and stir fry. In this article, we’ll help you make the right purchase by learning what features to look for. We’ve narrowed down our choices to five. What ﻿I﻿s ﻿A﻿ ﻿V﻿egetable ﻿C﻿hopper? What ﻿﻿﻿S﻿﻿﻿hould ﻿Y﻿ou ﻿G﻿et: Manual Or Electric? What ﻿S﻿hould ﻿Y﻿ou ﻿L﻿ook ﻿F﻿or ﻿I﻿n ﻿A﻿ ﻿V﻿egetable ﻿C﻿hopper? A vegetable chopper is an essential tool in the kitchen if you want to chop vegetables fast and easy. However, the many types and brands currently available might stress you out. To narrow your choices, we selected five of the most popular brands on the market and reviewed them based on their features and performance. What Should You Get: Manual Or Electric? When buying a vegetable chopper, the first thing that you should decide is whether to get an electr﻿ic or manual model. 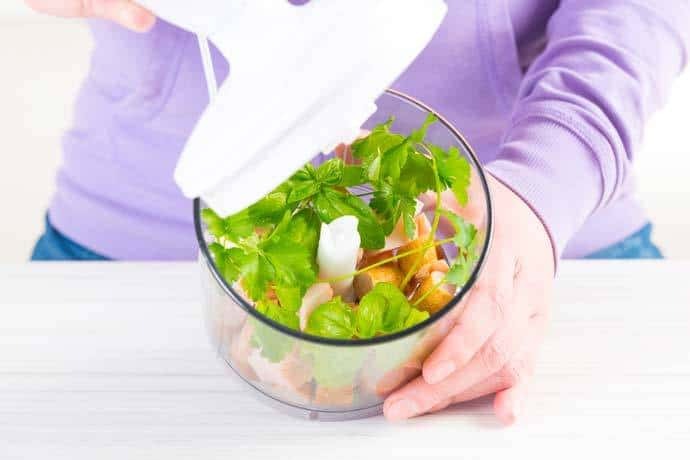 An electric vegetable chopper is a faster and it's the more convenient way of chopping ingredients. 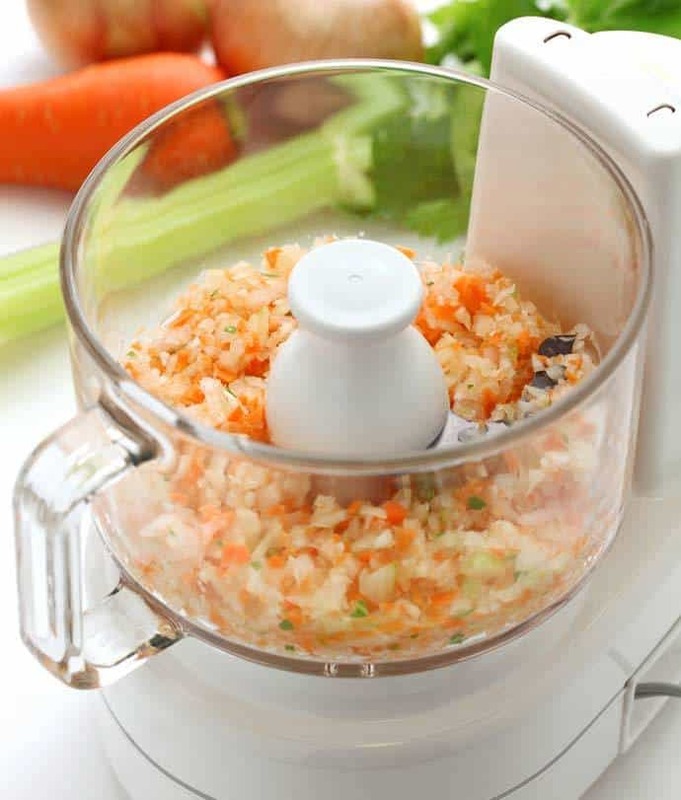 With just a touch of a pulsing button, vegetables can be chopped thoroughly with precision. However, you need to rely on electricity to use this type of chopper. A manual vegetable chopper, on the other hand, can be pretty useful for outside trips because you don’t need to depend on any power grid. Although it may offer a large set of blades for versatility, you may have to use manual force to slice each vegetable. This may be not a big deal for some users, but for those with arthritic hands, the manual operation may be a challenge. What Should You Look For In A Vegetable Chopper? If you frequently chop vegetables in large volumes, look for a large capacity size. A vegetable chopper can go as large as six cups. However, it may tend to cost more and consume a large counter space. A capacity of three cups is a good capacity for most tasks. Vegetable choppers cut vegetables fast but cleaning can be a headache especially when a lot of food residues are stuck at the corners of the bowl and blade. For more convenience in cleaning, look for more dishwasher-safe parts. At the least, look for choppers with a dishwasher-safe bowl and blade. A manual vegetable chopper may offer more than one blade to perform several cuts, such as dices, shreds, and squares. More blades mean more versatility. Of course, you also need to consider the ease of changing blades. You want something that allows you to change blades easily and fast. For electric models, the chopping option may vary from coarse to fine, depending on the number of pulse speeds. For example, Hamilton Beach 72600 offer two pulse speeds to provide accurate control. Since most vegetable choppers are made of plastic bowls, you want to make sure that they’re bisphenol-free (BPA-free) to ensure safety. BPA chemicals are added to plastics to make their shape hard. According to National Institute of Environmental Health Sciences (NIEHS), BPA can get into your food and cause serious health risks. 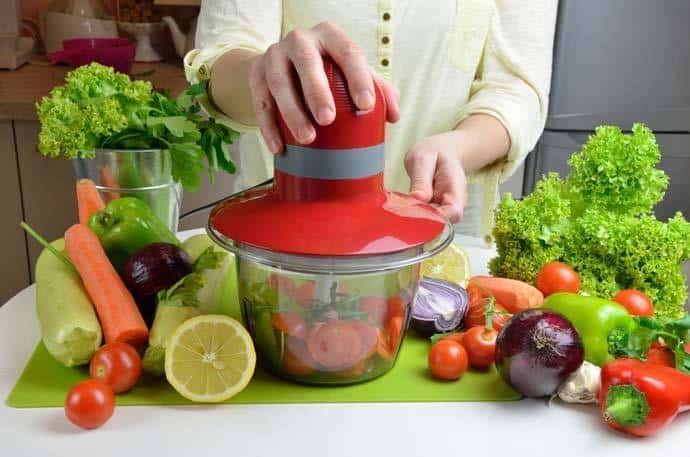 Aside from food safety, you want your vegetable chopper to be safe to use. Some manual vegetable choppers have hand guards to protect your fingers from random cuts. You want to make sure the blades can be removed easily for cleaning. Whether you choose a manual or electronic vegetable chopper, make sure that you look for stainless steel blades. According to metallurgical engineer Michael L. Free, stainless steel doesn’t rust due to the interaction of its elements to oxygen. Such interaction creates a stable film that prevents corrosion. To get the best value for your money, look for vegetable choppers that can chop all sorts of vegetables and other food. Some of the most versatile models not only chops vegetables, but they can also grate ﻿﻿cheese and even mince nuts. The more versatile the product, the better. The Mueller Vidalia Chopper Pro is a heavy-duty manual vegetable chopper. It’s made of BPA-free food grade thermoplastic resin for extreme durability. The two blades are made of the highest grade German 420 stainless steel to chop even the hardest vegetable in one easy motion. What I love about this chopper is its ability to minimize onion vapors and a large 4-cup capacity bowl that can also serve as a storage container. Aside from the chopper, you also get a cleaning brush and a recipe ebook. Best of all, it’s backed by a lifetime warranty. The Braviloni Mandoline Slicer is a versatile manual chopper that includes five blades to grate cheese, slice vegetables, and even cut fruits. With a hand guard, this unit is very safe to operate even for children. Cleaning is easy too with the no corners and grooves for your food to get stuck in. The container base catches all the food that you chop neatly. What I admire about this product is its blade holder that can store blades safely. If you’re not satisfied with the unit you can ask for a full refund within 30 days of purchase. 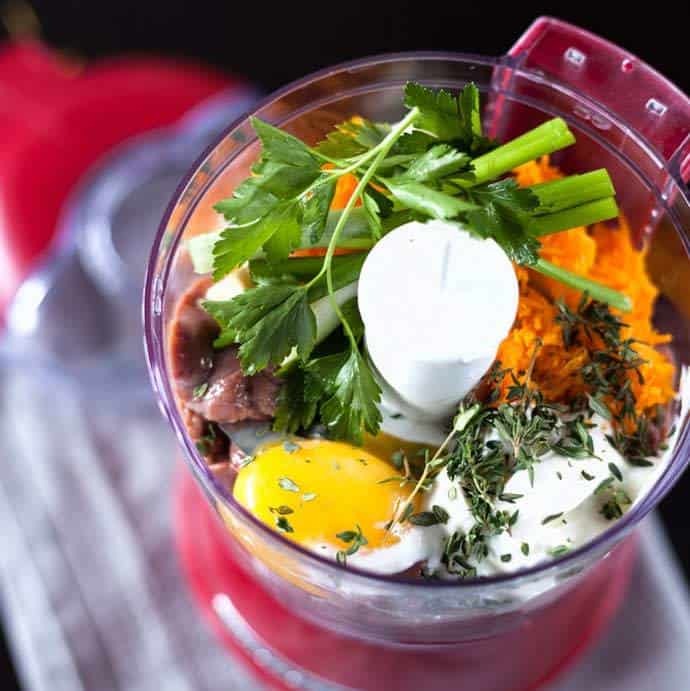 The Brieftons Manual Food Chopper is a powerful handheld chopper that can mince, puree, and blend vegetables. Both the plastic bowl and stainless steel blade are dishwasher safe for ease of cleaning. The 3-cup plastic bowl is BPA-free and the blades are all hidden during use for safety. The food chopper is built with a cord which needs to be pulled when mincing/ blending/ chopping your ingredients. Aside from the food chopper, you also get three recipe ebooks. If you’re not happy with your purchase, you can ask for a full refund. The Hamilton Beach 72600 is an electric chopper that features a large 3-cup capacity. The two pulsating speeds offer accurate control. Both the stainless steel blade and plastic bowl are dishwasher safe for ease of cleaning. The hideaway cord wrap stores the cord safely at the bottom of the unit. A quick-lock lid keeps the food from spilling over the bowl while the chopping operation is going on. From nuts to fruits, and vegetables, you can chop or mince them fast with its 135-wattt power. The Proctor Silex 72500RY is an electric vegetable chopper that features a stable base and a clear work bowl. The pulse function provides excellent control to produce consistent results. The stainless steel blade can be detached from the bowl to be cleaned thoroughly. At 1-1/2 cup capacity, this food chopper is ideal for a household of two people. What I love about this unit is its compact size which can accomplish multiple chopping or mincing tasks. From chocolates to nuts and vegetables, you can relatively chop anything. As you see on our scores above, the best vegetable chopper is the Vidalia Chopper Pro because it has most of the best features that we’re looking for. This manual vegetable chopper has versatile functions, dishwasher-safe, and BPA-free. Two of the reasons why this unit prevails over other choppers are its large 4-cup capacity and the sturdiest German 42-grade stainless steel blades.